The Salvation Army is a Christian based organisation who believes in spreading the message of Jesus Christ: a message and lifestyle that is based on the Bible's teaching. Its work is to make known the good news about Jesus Christ and to persuade people to become his followers, something they advocate through charity work and events. It was first born on the streets of the East End of London in 1865, and since then has carried on the commitment of their founders to serve God and to serve suffering humanity by fighting against social injustice. The charity has been around for over 150 years, and has held many large events that have brought great attention to social injustices and horrors even in modern day society. One of the main areas that they bring attention to is the tragic and abhorrent situation of homelessness in the UK. By doing so the salvation army have been able to renew and improve the lives of thousands of families, through fundraises and donations, across the world and not just in the UK. Every Christmas, the salvation army have a hot soup and sandwiches run. These run begin during the colder months as a way to provide many homeless people young and old with something warm to drink and eat. These small meals are sometimes the only ones that many of these vulnerable people have for days. Hot Christmas dinners and presents are all but a dream to them, and nothing more. Additionally, the members and volunteers at The Salvation Army are sometimes the only representation of festive joy that many of the homeless will experience this Christmas season, as in many cases they are turned away and left in the cold. The charity is also very active in their attempt to provide lonely older people with company at Christmas. This means that volunteers that work alongside the Charity give up some of their time at Christmas to pay visits to older people who would usually never see another person for up to 2-3 months. These vital volunteers provide a bit of Christmas cheer to people who have been left alone and neglected, by their families and society as a whole. 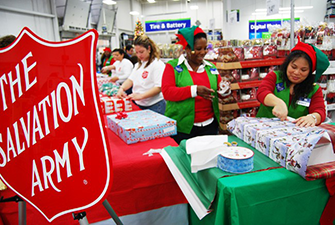 The work of the Salvation Army, especially at Christmas, is a vital one. Without them many innocents will be left suffering cold and alone at Christmas time, with no festive joy to light up their lives. You too can be a part of this movement a small donation can provide someone shelter and warm food, forgotten grandparents company and poor families a meaning full Christmas.